So I happened upon some Chinese-style baked beans in tomato sauce whilst perusing the shelves of my local supermarket. They’ve made their way here! are to China; they both provide cheap and tasty (but not wholly healthy) nourishment and are staunchly favoured by students. Now, don’t get me wrong, I love Chinese food, but occasionally it’s nice to have those simple foods from back home and not have to empty out your wallet for them at a local jinkou 进口(import) store. Therefore, my discovery made my weekend. My excitement was short lived. They look convincing don’t they? Arghf! Nooo! I made a mistake. They weren’t beans. Well they were, but *sigh* they were the wrong beans. This company had taken a look at some baked beans and thought, ‘We can make those … all we need are some yellow soybeans and tomato sauce.’ Yes, alas, they used yellow soya beans, 黄豆 (huang dou). It was immediately noticeable about a nanosecond after tasting. Yellow soybeans? I enjoy eating soybeans in their various guises, but not when they are masquerading as haricot beans stewed in tomato sauce. Milk Tea/Nai Cha/Bubble Tea – call it what you want, but it comes in granulated form and it’s grand. 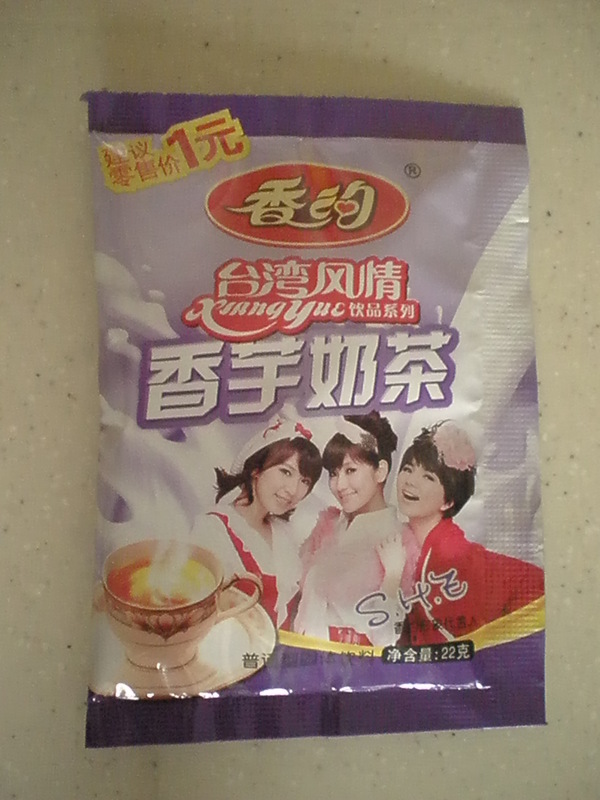 The pop group on the sachet are all girl group, SHE. They’ve been around forever, but their manager won’t let them quit. but soybeans in tomato sauce may have to join the ranks of other Chinese ‘east meets west taste bud crossover delights‘ such as green bean ice creams and green tea tooth paste. So, it’s back to viewing baked beans as a fancy, pricey commodity only to be eaten on special occasions. I think these beans sound really interesting – a nice hybrid of food styles. But obviously not if you were expecting them to taste/feel like Heinz. They were pretty horrible. The texture was all wrong. We never bought ’em again and stuck to buying Heinz, which actually varied in quality because the ones were buying in the import store started being produced in China (yet they were still sold in the import stores at a higher price), and China isn’t known for quality control. Sometimes the beans would be really hard or the sauce was a bit off. One of the perks of being back home is being able to buy baked beans that don’t vary in quality and taste with each can.